Embark on a 5-day hike along Peru's Salkantay Trek, culminating with a visit to Machu Picchu: one of the 7 New Wonders of the World. 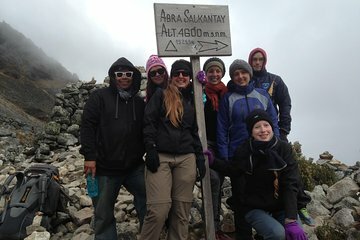 Less congested than the popular Inca Trail, the Salkantay Trek is just as spectacular You'll wind your way over mountain passes, past incredible Andes peaks, through cloud forest and along riverbeds—stopping to soak in thermal baths as you go. Enjoy an early morning tour of the 'Lost Inca City' and extra time to explore on your own. This guided multi-day journey includes round-trip Cusco transport.